Wayne Rooney has set so many landmarks that he could almost have an entire episode of Record Breakers dedicated to him. The Manchester United striker passed another one by scoring Sunday's winner at Liverpool, overtaking Arsenal's Thierry Henry as the scorer of the most goals for a single club in Premier League history. 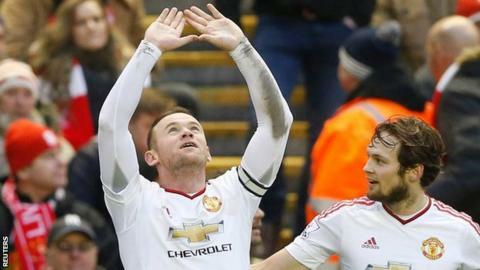 Rooney, 30, rifled in his 176th league goal for the Red Devils since arriving from Everton in 2004. Here, we take a look at some other weird and wonderful goalscoring records. Leicester City striker Jamie Vardy set a new Premier League record in November by scoring in 11 consecutive games, beating Ruud van Nistelrooy's 15-year record. Van Nistelrooy's 10 consecutive goals came while he was at Manchester United in 2003, but that was over the course of two seasons, starting in March that year and ending in August. Vardy could not quite equal the all-time record of consecutive goals scored at the elite level of English football, which was set by Jimmy Dunne back in 1931-32. Playing for Sheffield United, Dunne scored 12 goals in succession. Stan Mortensen hit 15 goals in consecutive games for Blackpool in the 1950-51 season, but he missed matches during that run because of injury, recovering to continue scoring when he returned to the side. It is not just Vardy who has been writing his name into the history books with his prolific form in front of goal this season. Cristiano Ronaldo became Real Madrid's all-time leading scorer with a goal against Levante on 17 October, moving him ahead of Raul's tally of 323. Bayern Munich's Robert Lewandowski, meanwhile, has enjoyed a purple patch most strikers can only dream of. This season the Poland striker became the fastest foreign player to 100 goals in the Bundesliga, and boasts an impressive 29 goals in 30 appearances for club and country. But while they are setting new standards for forwards, they need to go some way to match the achievements of some of these goal machines. Edson Arantes do Nascimento, better known as Pele, won three World Cups with Brazil and is widely considered the best player of all time. He also holds the record for the most career goals scored, with 1,279 in 1,363 games, from 7 September 1956 to 1 October 1977. Pele's most prolific year was 1959, when he scored 126 goals. A special mention goes to fellow Brazilian Romario, who in 2007 celebrated what he said was his 1,000th goal, according to his "personal count". Romario's total included 77 goals he scored at youth level and a further 21 in friendly and testimonial matches. Then there is another Brazilian - Arthur Friedenreich, who according to the Guinness Book of World Records scored an undocumented 1,329 goals in 26 years between 1909 and 1935, a feat not recognised by Fifa. Oceania, it seems, is a playground for prolific strikers. In July, Jean Kaltack scored 16 goals for South Pacific country Vanuatu in a 46-0 win over Micronesia in an Olympic qualifying tournament. Unfortunately for Kaltack, his feat does not stand up as a bona fide world record because it came in an under-23 tournament. As far as full internationals go, Archie Thompson holds the world record for a match with 13, including eight before half-time, as Australia beat American Samoa 31-0 in a World Cup qualifier in 2001. On the domestic front, Cypriot striker Panagiotis Pontikos scored a record 16 goals in one game for SEK Ayios Athanasios FC in the Greek third division in 2007. But his tally only equalled the feat first achieved by Stephan Stanis, who managed the same number for Racing Club in a French Cup match against Aubry Asturies in 1942. Former England centre forward Joe Payne still holds the record for most goals in a Football League match with 10 in Luton Town's 12-0 victory against Bristol Rovers in 1936. Nawaf Al Abed is believed to hold the record for the fastest goal in football, scoring just 2.4 seconds after kick-off. The midfielder netted with a 60-yard lob after being passed the ball by an Al Hilal team-mate in a game against Al Shoalah in Saudi Arabia in 2009. Guinness World Records do not have an entry for the fastest goal scored but in 2004 the Football Association confirmed amateur footballer Marc Burrows had netted the quickest it was aware of. Burrows, playing for Cowes Sports FC on the Isle of Wight, scored against Eastleigh Reserves in two and a half seconds in 2004. Nicklas Bendtner did not leave a great goalscoring legacy when he left Arsenal for Wolfsburg in 2014. But the Denmark striker still holds the record for the fastest goal by a substitute in the Premier League, scoring in six seconds against Tottenham in 2007. Asmir Begovic is in the Guinness World Records for scoring the longest-range goal recorded in football. The Chelsea goalkeeper scored the goal, measured at 91.9m (301ft 6in), playing for Stoke against Southampton in November 2013. The Bosnian's long kick forward after just 13 seconds cleared the Southampton defence before bouncing over counterpart Artur Boruc for the opener. Think that is impressive? How about scoring with a header from 58.13m (190ft 8.58in)? That honour goes to Norway's Jone Samuelson who scored with his head from inside his own half when playing for Odd Grenland against Tromso in 2011. Goalkeepers are more used to saving shots than scoring them - unless you are Brazilian Rogerio Ceni. The 42-year-old - a penalty and free-kick expert - scored his 128th goal in June, the most ever scored by a goalkeeper. Ceni, who was in Brazil's World Cup-winning squad of 2002, is one of the top 10 all-time goalscorers for Brazilian club Sao Paulo. Then there is Jose Luis Chilavert, the Paraguay international who is the only keeper to have scored a hat-trick. He achieved the feat in 1999, scoring three penalties for Argentine side Velez Sarsfield against Ferro Carril Oeste. Chilavert also managed eight goals for his country, including four to help Paraguay reach the 2002 World Cup finals. Southampton's Sadio Mane may have scored the quickest hat-trick in Premier League history last season in two minutes and 56 seconds. But it is over a minute slower than Tommy Ross, who holds the record for the fastest hat-trick of all-time. Ross netted his three goals - for Ross County against Nairn County in 1964 - in 90 seconds. Cameroon's Roger Milla - he of the iconic corner flag celebration - was 42 when he became the oldest ever World Cup goalscorer at the 1994 finals. But he is a youngster compared to Japan forward Kazuyoshi Miura, who at the age of 48 is still scoring goals for Yokohama FC in the J-League Division 2 after signing a one-year contract extension in November. Miura, the world's oldest active professional footballer, signed his first professional contract in 1986. And he might yet surpass the achievement of Billy Meredith, who scored for Manchester City against Brighton in the FA Cup at the age of 49 years, 208 days in 1924 and is the oldest international goalscorer, netting for Wales against England aged 45 years, 73 days in 1919. Among women footballers, Abby Wambach has scored an incredible 184 goals in 252 games for the USA at an average of a goal every 1.36 games. Wambach, who won the World Cup in 2015, holds the world record for the most international goals scored by an individual in footballing history. For the men, Iran legend Ali Daei holds the international record, with the striker finding the net 109 times in 148 games. The former Bayern Munich forward retired in 2007, after a 19-year career. Former Belgian defender Stan van den Buys holds the unwanted record of scoring a hat-trick of own goals as Germinal Ekeren lost 3-2 to Anderlecht in 1995. But his record is eclipsed by the players from Madagascar side Stade Olympique I'Emyrne, who scored 149 own goals in a national league game against arch-rivals AS Adema in 2002. The outlandish scoreline came about as Olympique deliberately scored one own goal after another in protest over a refereeing decision.